Incretins stimulate insulin secretion in a glucose-dependent manner but also promote pancreatic beta cell protection. Dipeptidyl peptidase-4 (DPP-4) inhibitors are a new glucose-lowering treatment that blocks incretin degradation by DPP-4. We assessed whether DPP-4 inhibition suppresses the progression to hyperglycaemia in a low-dose streptozotocin (STZ)-induced diabetic mouse model, and then investigated how DPP-4 inhibition affects islet function and morphology. The DPP-4 inhibitor, des-fluoro-sitagliptin (SITA), was administered to mice during and after STZ injections, and in some mice also before STZ. In control mice, STZ resulted in hyperglycaemia associated with impaired insulin secretion and excess glucagon secretion. In SITA-treated STZ mice, these metabolic abnormalities were improved, particularly when SITA administration was initiated before STZ injections. We observed beta cell loss and dramatic alpha cell expansion associated with decreased insulin content and increased glucagon content after STZ administration. In SITA-treated mice, islet architecture and insulin content were preserved, and no significant increase in glucagon content was observed. After STZ exposure, beta cell apoptosis increased before hyperglycaemia, and SITA treatment reduced the number of apoptotic beta cells. Interestingly, alpha cell proliferation was observed in non-treated mice after STZ injection, but the proliferation was not observed in SITA-treated mice. Our results suggest that the ability of DPP-4 inhibition to suppress the progression to STZ-induced hyperglycaemia involves both alleviation of beta cell death and alpha cell proliferation. The online version of this article (doi: 10.1007/s00125-011-2365-4) contains peer-reviewed but unedited supplementary material, which is available to authorised users. Type 2 diabetes mellitus is a metabolic disease characterised by chronic hyperglycaemia which is due to insufficient insulin secretion from pancreatic beta cells and insulin resistance in peripheral tissues. A major goal of therapies is to prevent the increase in mortality attributed to diabetic complications such as cardiovascular disease and end-stage renal failure. Beta cell dysfunction progresses to a reduction in beta cell mass, which is caused by beta cell death in diabetic patients [1, 2], and ultimately many patients with type 2 diabetes are treated with exogenous insulin. Notably, it has been reported that impaired insulin secretion contributes more to the pathophysiology of Japanese and Asian diabetic patients than of white patients, who are more generally characterised by obesity and insulin resistance [3, 4]. The incretin hormones, glucose-dependent insulinotropic polypeptide (GIP) and glucagon-like peptide-1 (GLP-1), are gastrointestinal peptides secreted from intestinal endocrine cells in response to meal ingestion which stimulate insulin secretion in a glucose-dependent manner. These hormones also promote beta cell proliferation and survival, and inhibit beta cell apoptosis in animals [5, 6]. The enzyme dipeptidyl peptidase-4 (DPP-4) degrades incretins upon their secretion from small intestinal cells [5, 6]. Therefore new glucose-lowering treatments using DPP-4-resistant GLP-1 receptor agonists and DPP-4 inhibitors can be expected to have protective effects on beta cells in human patients. Indeed, it has been reported that sitagliptin, a DPP-4 inhibitor, not only improves glucose metabolism but also protects beta cells, promotes islet neogenesis, and prolongs islet graft survival in rodent diabetic models [7, 8, 9]. Furthermore, DPP-4 inhibitors have been reported to delay or suppress the occurrence of hyperglycaemia in an animal model of spontaneous diabetes , but the mechanisms have not been completely elucidated. 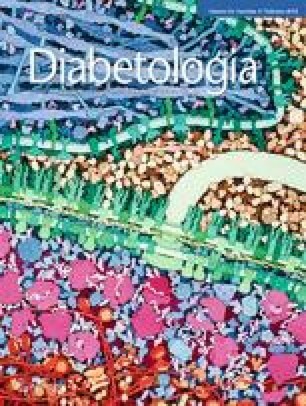 Here, we assessed whether DPP-4 inhibition can suppress the progression to hyperglycaemia in a streptozotocin (STZ)-induced diabetic mouse model characterised by relatively slow-onset diabetes, selective beta cell death and ultimately hyperglycaemia attributed to insulin deficiency [11, 12]. We further investigated how DPP-4 inhibition benefits islet function and morphology and improves glucose metabolism in STZ-treated mice using in vivo and in vitro experiments. Six-week-old male C57BL/6 mice were purchased from CLEA Japan (Tokyo, Japan) and housed under a 12 h light/dark cycle with free access to food and water. All procedures were performed in accordance with Asahikawa Medical University guidelines for the use of animals, with the approval of the university committee. Des-fluoro-sitagliptin (SITA) was provided by Merck & Co. (Whitehouse Station, NJ, USA) and pre-mixed at 4 g/kg of normal chow (Purina no. 5015) by Research Diet (New Brunswick, NJ, USA). Mice were fed either a normal rodent chow diet (designated N, Purina rodent chow no. 5015) or a mixed rodent chow diet (designated S, diet containing SITA), ad libitum for 14 days before five consecutive intraperitoneal injections of STZ (50 mg/kg; Sigma Chemical, St Louis, MO, USA) dissolved in sodium citrate buffer or vehicle alone (further details are provided in Electronic supplementary material [ESM] Fig. 1a). The mice were then maintained on the same initial diets for an additional 20 days of observation (groups NN and SS), while one cohort was transitioned from the normal diet to the SITA diet during and after STZ injections (group NS). Additional cohorts of mice were treated as above but killed 1 day after the last STZ injection for islet analysis (ESM Fig. 1b). Another group was treated with exendin-4 (EX; 48 nmol kg−1 day−1 intraperitoneal injection once a day) to compare ‘incretin’ action on islets with SITA. Non-fasted blood was collected from the tail vein, and blood glucose levels were measured at 10:00 hours with a Onetouch Ultra glucometer (Lifescan Japan, Tokyo, Japan) on days 1, 15 (the first day of STZ injection), 19 (the last day of STZ injection), 32 (2 weeks after last STZ injection) and 39. Body weight was determined at the time of glucose measurement. HbA1c levels were measured using a DCA Vantage Analyzer (Siemens, Munich, Germany) on blood collected from the tail vein on day 38. We performed an OGTT on day 29 and 2 weeks after initiating the STZ injections, when mice may show raised blood glucose levels as previously reported . Mice were fasted for 16–18 h before the OGTT. Blood glucose levels were measured at 0, 10, 30, 60 and 120 min after oral glucose delivery (2 g/kg body weight). For plasma insulin determinations, blood samples (each 30 μl) were collected from the tail vein into heparinised packed cell volume tubes at 0 and 10 min. Collected samples were separated by centrifugation at 4°C and stored at −20°C until assay. Plasma insulin levels were measured using a mouse insulin ELISA kit (Morinaga Institute of Biological Science, Yokohama, Japan) according to the instructions. We determined glucose-stimulated insulin secretion (GSIS) by calculating the difference in insulin concentration at 0 and 10 min after the glucose load. At day 39, mice were killed after the last glucose and body weight measurement, and blood samples (200 μl) were collected after 16–18 h of fasting for plasma insulin and glucagon assays, and at 10 min after refeeding for plasma GLP-1 and GIP assays. Collected blood samples were mixed with a 10% volume of cooled saline containing 12.5 mg/ml EDTA-2Na and 5,000 units/ml aprotinin. These were immediately separated by centrifugation at 4°C and stored at −20°C. Plasma insulin levels were assayed as described above, and plasma glucagon levels were assayed using a glucagon EIA kit (Yanaihara Institute, Fujinomiya, Japan) according to the instructions. The EIA kit detects pancreatic glucagon and does not cross-react with enteroglucagon, GLP-1 and GLP-2. Active GLP-1 and GIP levels were measured by bioassay as previously described [14, 15]. We used guinea pig antibody to insulin (Millipore, Billerica, MA, USA), mouse antibody to glucagon (Sigma-Aldrich Japan, Tokyo, Japan), rabbit antibody to glucagon (Cell Signaling Technology Japan, Tokyo, Japan), mouse antibody to proliferating cell nuclear antigen (PCNA) (BD Biosciences, Tokyo, Japan), and rabbit cleaved caspase-3 antibody (Cell Signaling Technology Japan) as primary antibodies. Alexa Fluor 488 anti-guinea pig IgG, anti-rabbit IgG, Alexa Fluor 594 anti-mouse IgG (Invitrogen, Carlsbad, CA, USA), and biotinylated goat anti-rabbit IgG (Vector Laboratories, Burlingame, CA, USA) were used as secondary antibodies. GLP-1(7–36)amide was purchased from Bachem (Torrance, CA, USA). GIP(1–42) was purchased from American Peptide Company (Sunnyvale, CA, USA), and exendin-4 was purchased from Tocris Bioscience (Ellisville, MO, USA). Pancreas was resected immediately after death at day 20 or 39, and fixed in 4% paraformaldehyde in PBS overnight at 4°C and then embedded in paraffin blocks after an ethanol wash. Embedded tissue was sliced into 3 μm thick sections and deparaffinised with a series of xylene and ethanol. We performed antigen retrieval with sodium citrate buffer (10 mmol/l sodium citrate containing 0.05% Tween 20, pH 6.0) followed by microwave heating and treatment of sections with a reagent for blocking non-specific background staining (Dako Japan, Tokyo, Japan). Slides were incubated with primary antibody overnight at 4°C, and, after they had been washed, they were incubated with secondary antibody for 2 h at room temperature in the shade. They were then washed and finally mounted in aqueous medium with DAPI (Vectashield Mounting Medium with DAPI; Vector Laboratories). Stained sections were observed under fluorescence microscopy (BZ-8100; Keyence, Osaka, Japan), and digital images were collected. Other sections were also immunostained using an avidin/biotin complex immunoperoxidase method with 3,3′-diaminobenzidine after antigen retrieval and treatment with hydrogen peroxide. We performed counter staining with haematoxylin in this method. We measured the insulin- and glucagon-positive cell area, as well as islet area using commercial software (BZ Analyzer; Keyence), and assigned these as beta cell area, alpha cell area and islet area, respectively. We also counted the number of insulin-positive cells, glucagon-positive cells, and total islet cells according to DAPI (nuclear) staining. All morphometry studies were conducted in a blinded fashion. Insulin and PCNA double positive cells were assigned as beta cell proliferation, and glucagon and PCNA double positive cells were assigned as alpha cell proliferation. Apoptotic beta cells were determined by cleaved caspase-3-positive and TUNEL-positive cells and adjusted for beta cell area in serial sections stained with insulin. TUNEL staining was performed using a commercial apoptotic cell detection kit (In Situ Cell Death Detection Kit, TMR red; Roche Diagnostics Japan, Tokyo, Japan). Pancreas was extracted by an acid/ethanol method. The tissue was placed in acid/ethanol (1.5% HCl in 70% ethanol) and incubated overnight at −20°C. Then, pancreas was homogenised and incubated overnight. Homogenised samples were centrifuged at 2,000 rpm for 15 min at 4°C, and the supernatant fraction was transferred to a new vial. Samples were neutralised with the same volume of 1 mol/l Tris/HCl (pH 7.5), and diluted 1:100 or 1:1,000 with PBS containing 0.1% BSA. Insulin and glucagon concentrations were measured using EIA kits as described above, and adjusted for protein concentration (BCA, Pierce Protein Research, Rockford, IL, USA). The mouse insulinoma cell line, MIN6, was maintained in DMEM (25 mmol/l glucose) with 10% FBS (Invitrogen Japan, Tokyo, Japan), 100 IU/ml penicillin and 100 μg/ml streptomycin (Invitrogen Japan) at 37°C in 5% CO2. MIN6 cells were cultured in DMEM for 48 h, after which medium was replaced with serum-free medium containing 0.2% BSA (Sigma-Aldrich Japan) and 10 nmol/l GLP-1(7–36NH2) and/or 10 nmol/l GIP(1–42). At 2 h after the addition of GLP-1 and GIP, we treated cells with 1, 3 or 5 mmol/l STZ, and incubated them for an additional 8 h. After incubation with STZ, the cells were fixed in 4% paraformaldehyde in PBS and then stained using the Roche apoptotic cell detection kit as mentioned above. Apoptotic cells were determined by counting the number of nuclei with positive TUNEL staining in 500 random cells. Data are expressed as mean ± SEM. Statistical analysis was performed using one-way ANOVA followed by the Bonferroni or Dunnett multiple comparison post test. Data were analysed using commercial software (Prism 5; GraphPad, San Diego, CA, USA). p < 0.05 was considered significant. First we examined if SITA treatment in the diet can increase active GLP-1 and GIP via DPP-4 inhibition in mice. Both active GLP-1 and GIP levels were significantly (p < 0.05) increased by SITA treatment (GLP-1: NN 60.6 ± 19.2 pmol/l vs SS 177.9 ± 41.7 pmol/l; GIP: NN 165.8 ± 76.3 pmol/l vs SS 2185.0 ± 734.1 pmol/l; n = 7). There was no significant difference in fed blood glucose levels among all experimental groups including non-diabetic controls before and during STZ treatment (Fig. 1a). Thereafter, we observed marked hyperglycaemia in non-treated diabetic control mice (NN group), whereas blood glucose levels were significantly reduced in mice maintained throughout on SITA (SS group) (19.9 ± 1.8 vs 29.8 ± 2.2 mmol/l at day 32, p < 0.01, and 17.1 ± 1.8 vs 29.0 ± 2.3 mmol/l at day 39, p < 0.001) and also in mice that were transitioned to the SITA diet during the STZ injections (NS group) (22.5 ± 2.6 vs 29.8 ± 2.2 mmol/l at day 32, p < 0.05, Fig. 1a). Body weight increased throughout the study in non-diabetic control mice, whereas mice injected with STZ lost weight irrespective of the treatment (Fig. 1b). We observed a significant increase in HbA1c levels in NN mice compared with non-diabetic control mice on day 38, while in both SITA-treated cohorts (NS and SS), HbA1c levels were significantly lower than in NN mice (3.7 ± 0.1% [16.9 ± 1.4 mmol/mol] in controls (C), 5.6 ± 0.2% [37.2 ± 2.5 mmol/mol] in NN, 4.5 ± 0.2% [25.7 ± 2.5 mmol/mol] in NS, and 3.9 ± 0.2% [18.6 ± 2.5 mmol/mol] in SS; Fig. 1c). These results demonstrate that chronic hyperglycaemia was dramatically improved by SITA treatment in low-dose STZ mice, particularly when SITA was started before STZ injections. We performed OGTTs to evaluate glucose tolerance and insulin secretion and determined GSIS by measuring the difference in insulin concentrations between 0 and 10 min after the glucose load. Blood glucose levels after the glucose load were slightly increased in the diabetic controls (Fig. 1d). While GSIS after the oral glucose load was dramatically impaired as expected in NN mice, it was significantly higher in SITA-treated NS and SS mice compared with NN mice (Fig. 1e, f). Thus DPP-4 inhibition partially alleviated the decrease in GSIS in low-dose STZ mice. We measured fasted plasma insulin and glucagon levels at day 39 to assess the degree of inappropriate glucagon secretion during diabetes. The glucagon/insulin ratio was higher in diabetic NN control mice compared with non-STZ-injected mice (C cohort), while the ratio was significantly lower in both SITA-treated cohorts (NS and SS) compared with NN mice (Fig. 1g). To evaluate the effect of DPP-4 inhibition on islet morphology in STZ-injected mice, we examined insulin and glucagon double immunofluorescence staining (Fig. 2a–d). Insulin-positive beta cell area was markedly reduced and glucagon-positive alpha cell area was strikingly increased in diabetic control mice (NN cohort) compared with non-diabetic control mice (C cohort) (Fig. 2a, b, e, g). However, in SITA-treated mice, especially the SS group which started SITA before STZ injections, beta cell area was increased and alpha cell area was significantly reduced compared with NN mice (Fig. 2c, d, e, g). We also observed reduced beta cell number and increased alpha cell number in NN mice similarly to beta cell and alpha cell area, whereas beta cell number was significantly increased and alpha cell number was significantly reduced in SITA-treated mice (Fig. 2f, h). These results indicate that DPP-4 inhibition with SITA not only protected against beta cell reduction but also suppressed alpha cell expansion in mice injected with low-dose STZ. In agreement with the above observations, we observed that pancreatic insulin content was markedly reduced in diabetic control mice (NN group) compared with non-diabetic controls (C group), while it was significantly higher in mice treated with SITA compared with NN mice (Fig. 3a). Moreover, pancreatic glucagon content was increased in NN mice compared with non-diabetic controls, while it was significantly lower in SITA-treated mice compared with NN mice (Fig. 3b). We observed alpha cell expansion including increased alpha cell number and pancreatic glucagon content accompanied by beta cell reduction in response to low-dose STZ injections. Hence, we performed glucagon and PCNA double immunofluorescence staining to quantify alpha cell proliferation (ESM Fig. 2a–d). Glucagon/PCNA double positive cells in islets were significantly increased in diabetic control mice (NN cohort) compared with non-diabetic control mice (C cohort), whereas such double positive cells were significantly reduced in SITA-treated NS and SS cohorts compared with NN mice (ESM Fig. 2e). These results indicate that alpha cell proliferation occurred in STZ mice, and this was inhibited by SITA. To further assess the protective effect of SITA on islets in STZ mice, we conducted immunohistochemical analysis 1 day after the last STZ injection (day 20), at a time when no overt hyperglycaemia was apparent (ESM Fig. 2f). We also compared the protective effects on islets between treatment with SITA and the GLP-1 receptor agonist exendin-4 (EX). The NN and SS groups exhibited a 30% increase in food consumption compared with non-diabetic controls (C), while the EX group had similar food consumption to C. We assessed beta cell death using two different types of immunostaining: (1) cleaved caspase-3, which plays a key role in the apoptotic pathway; (2) TUNEL staining, which detects DNA fragmentation. Cleaved caspase-3-positive cells and TUNEL-positive cells in islets were significantly increased by injection of STZ (NN mice compared with C mice), while in the SS and EX cohorts (treated with SITA and exendin-4, respectively), apoptotic cells were significantly reduced compared with NN mice (Figs 4 and 5a, b). There was an increase in insulin/PCNA double positive cells in exendin-4-treated mice compared with the NN group, but this did not reach statistical significance (Fig. 5c). Notably, glucagon/PCNA double-positive cells were strikingly increased following STZ injection in the NN mice, and this was significantly reduced towards control levels by SITA treatment (SS cohort; ESM Fig. 2g). These results clearly indicate that STZ exposure acutely results in beta cell death and dramatic alpha cell proliferation. In addition, SITA protects beta cells from STZ-induced cell death as well as exendin-4, and SITA also suppresses alpha cell proliferation immediately after STZ exposure. Moreover, our results indicate that SITA treatment attenuated beta cell loss in STZ mice via anti-apoptotic effects rather than by proliferative effects. Since enhanced activity of GLP-1 and GIP is thought to be the primary mechanism of islet actions of DPP-4 inhibition, we further examined whether GLP-1 and GIP can directly protect beta cells from STZ-induced cell death in vitro using the MIN6 beta cell line. We determined the extent of MIN6 cell apoptosis by counting the number of cells with positive TUNEL staining. STZ induced apoptosis in MIN6 cells in a concentration-dependent manner (ESM Fig. 3). GLP-1 and GIP equivalently and effectively suppressed MIN6 cell apoptosis induced by STZ at each concentration examined (ESM Fig. 3). Interestingly, GLP-1 and GIP additively suppressed MIN6 cell apoptosis by 5 mmol/l STZ treatment (ESM Fig. 3). DPP-4 inhibitors are a new class of oral glucose-lowering agents that act to block GIP and GLP-1 degradation by DPP-4 activity, and thereby enhance insulin secretion in a glucose-dependent manner. Incretin hormones also have protective effects on pancreatic beta cells by promoting cell survival and proliferation, and inhibiting cell death [5, 6], but whether the same benefits can be realised in humans remains to be determined. In the present study, we determined that placing the DPP-4 inhibitor, SITA, in rodent chow effectively raised active GLP-1 and GIP levels. We then demonstrated that DPP-4 inhibition reduced the progression to overt hyperglycaemia and alleviated the reduction in glucose-stimulated insulin secretion in low-dose STZ mice. In addition, we found that SITA treatment reduced the increased glucagon/insulin ratio that ensued rapidly after STZ injections, and, undoubtedly, this contributed to the glucose-lowering action of SITA in this model of diabetes. In diabetes, inappropriate glucagon secretion in fasting and postprandial states contributes to hyperglycaemia [16, 17, 18, 19, 20, 21, 22, 23], besides impaired insulin secretion attributed to beta cell failure. Although we could not clarify the precise mechanism of how SITA reduced the relative glucagon secretion, we assume that SITA-mediated enhanced levels of endogenous active GLP-1 may have suppressed glucagon secretion from alpha cells, as previously reported . In association with modest preservation of beta cell mass and insulin content in SITA-treated mice, we observed a reduction in STZ-induced alpha cell expansion and associated increased glucagon content with SITA treatment. Therefore SITA may contribute to both beta cell protection and regulation of alpha cell number in STZ mice. A recent study reported that DPP-4 inhibitor regulation of glycaemia, insulin secretion and glucagon secretion involves not only enhancement of active GLP-1 and GIP levels but also reduced liberation of the bioactive dipeptides, His–Ala and Tyr–Ala, generated by DPP-4 . Therefore, additional mechanisms besides the enhancement of bioactive incretin levels may contribute to the improvement in glycaemia we observed in this study. To directly investigate the protective effects of DPP-4 inhibition on islets, we conducted immunohistochemical analysis after STZ injection but before marked hyperglycaemia occurred. Apoptotic cells, with positive cleaved caspase-3 or TUNEL staining, were increased in non-treated STZ mice, whereas these apoptotic cells were significantly reduced in SITA-treated mice equivalently to mice treated with exendin-4, a GLP-1 receptor agonist. On the other hand, we did not observe a significant increase in PCNA-positive beta cells in SITA-treated mice. These results suggest that DPP-4 inhibition with SITA may primarily protect beta cell mass via an antiapoptosis mechanism rather than induction of cell proliferation or replication. We performed in vitro studies using MIN6 beta cells to confirm the direct antiapoptotic effects of incretins on beta cell protection from STZ-mediated toxicity. STZ induced apoptosis in ΜΙΝ6 cells in a concentration-dependent manner, and both GLP-1 and GIP equivalently suppressed MIN6 cell apoptosis. Intriguingly, GLP-1 and GIP additively suppressed MIN6 cell apoptosis on exposure to the highest dose of STZ. These findings are in agreement with previous studies showing that both GLP-1 and GIP receptor signalling can suppress apoptosis in beta cell lines induced by cytotoxic agents [26, 27, 28, 29, 30, 31]. In addition to the common antiapoptotic pathways of GLP-1 and GIP signalling [6, 26, 27, 28, 29, 30, 31], different pathways [32, 33, 34, 35, 36] may promote additive antiapoptotic effects on beta cells, as observed in our analysis of STZ-induced apoptosis studies with MIN6 beta cells. Interestingly, we observed considerable alpha cell expansion with increased pancreatic glucagon content in non-treated low-dose STZ mice compared with non-diabetic control mice. In addition, PCNA-positive alpha cells in islets were significantly increased in non-treated diabetic mice compared with control mice, indicating alpha cell proliferation in the diabetic mice. In addition to the apparent functional abnormality of alpha cells that results in inappropriate glucagon secretion, there are previous reports of apparent alpha cell expansion in diabetic humans [37, 38, 39, 40, 41] and rodents [42, 43], which may contribute to raised glucagon levels. Although alpha cell expansion is commonly observed after beta cell loss, the mechanisms regulating alpha cell number under physiological and diabetic conditions are not well understood. IL-6 stimulates alpha cell proliferation in a high-fat diet fed state with insulin resistance , and glucagon receptor knockout mice display alpha cell hyperplasia . In Psammomys obesus, alpha cell expansion was observed in association with elevated pancreatic GLP-1  after diet-induced hyperglycaemia. In our study using the beta cell toxin, STZ, pancreatic alpha cells proliferated concomitantly with beta cell death after STZ exposure yet before significant elevation of blood glucose levels. These findings suggest that alpha cell proliferation is not caused by hyperglycaemia. Decreased insulin action in pancreatic alpha cells leads to enhanced glucagon secretion . Therefore it is possible that local insulin deficit in islets caused by beta cell loss leads to pancreatic alpha cell proliferation. Interestingly, Thorel et al. showed that alpha cells can be converted into beta cells under conditions of extreme damage to beta cells . Also, alpha cell proliferation and elevated glucagon levels may aid in the formation of new beta cells, since pancreatic glucagon is required for beta cell formation and differentiation . Moreover, recent studies have shown that alpha cells are a source of both GLP-1 and GIP, raising the potential of their involvement in regulation of beta cell mass and function [14, 46]. It is interesting to consider that incretins, secreted not only from the gastrointestinal tract but also from pancreatic islets, may coordinately regulate islet function and morphology. Therefore we suggest that DPP-4 inhibition may enhance incretin function locally in islets and may thereby contribute to their effectiveness in diabetes. In conclusion, our present study indicates that DPP-4 inhibition with SITA suppresses the progression to overt hyperglycaemia in mice given low-dose STZ with alleviation of both beta cell death and alpha cell proliferation. Whether early use of DPP-4 inhibitors can suppress the progression to overt diabetes in humans warrants investigation. We thank MSD Merck & Co. (Whitehouse Station, NJ, USA) for providing des-fluoro-sitagliptin and supporting the research fund. We also thank J-i. Miyazaki (Osaka University, Japan) for providing MIN6 cells. Y Takeda, YF, JH, TY, HS, Y Takiyama, YM, AA, TJK, MH contributed to the study concept and design; Y Takeda, YF, JH, TY acquired the data; Y Takeda, YF, JH, TY, HS, Y Takiyama, YM, AA, TJK, MH analysed and interpreted the data and performed statistical analysis; Y Takeda, YF drafted the manuscript; Y Takeda, YF, JH, TY, HS, Y Takiyama, YM, AA, TJK, MH reviewed the manuscript for important intellectual content; YF obtained funding; MH supervised the study.